Ivy on walls – biodeterioration or bioprotection? Prof. Heather Viles, Dr Martin Coombes and Alan Cathersides. Ivy has long been seen as a nuisance at historic sites, capable of damaging vulnerable stonework and obscuring important architectural details. Because of these perceptions attempts have routinely been made to remove ivy from historic sites. However, the lack of proper scientific information on how to remove ivy successfully and whether or not ivy does damage (or indeed could protect walls from other agents of deterioration) has hampered the development of appropriate management strategies based on real conservation needs. As site management costs rise, and budgets are cut, there is a real need to find out whether ivy needs to be removed (and if so, how), or whether ivy can aid conservation (and if so, how it should be managed). The first phase of the ivy on walls research project (2006-2010), commissioned by English Heritage, successfully demonstrated the beneficial role of ivy in moderating the microclimate on walls. The second phase of the research (2012-2016) focuses on answering two main research questions: Do vulnerable building materials deteriorate more or less when covered with ivy? Under what circumstances does ivy root into and under deteriorating walls, what damage does it do, and how can we minimise these effects? More information can be obtained about this project by visiting the project website. Funded by the European Commission within the Marie Curie FP7 programme, the research project (PIEF-GA-2013-622417; Sept. 2014 – Sept. 2016) aims to assess the performance and durability of commercial anti-graffiti and self-cleaning coatings on concrete and stones through long-term exposure tests on outdoor conditions (Wytham Woods field site and walls at the University) and accelerated weathering in climatic chamber, with periodical cleaning episodes taking place, in order to obtain a more precise knowledge of application of these products for Cultural Heritage protection. Bioprotection of Coastal Rocks and Structures. Dr Martin Coombes, Dr Larissa Naylor (University of Exeter), Prof. Heather Viles, Prof. Richard Thompson (University of Plymouth), Jon Par (Marine Biological Association). This multi-institution research project is examining how common organisms found in the intertidal zone influence conditions for weathering on natural rocks and engineering structures. 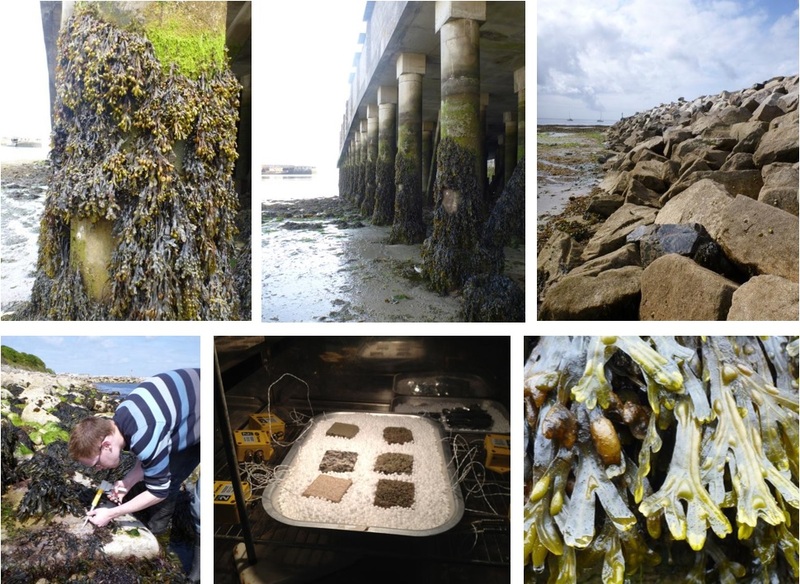 Fieldwork has been undertaken looking at the influence of seaweed on micro-climate on seawalls and breakwaters, and the influence of barnacles on internal rock thermal regimes is being investigated in the laboratory. We want to know whether encouraging animals and plants to colonise coastal structures for conservation purposes can provide additional durability benefits, to help support the uptake of ecological enhancement activities at the coast. More information can be found on the project website (http://www.biogeomorph.org/coastal/bioprotection/index.html). Climate change, ‘greening’ of masonry and implications for the decay of built heritage and new build. Prof. Heather Viles, Prof. Andrew Whiteley (Centre for Ecology and Hydrology), Dr Nick Cutler, Dr Julie Eklund and Samin Ahmad. This EPSRC-funded project was carried out in collaboration with Prof. Bernie Smith, Prof. Muhammed Basheer, Dr Nick Betts and Dr John McAlister of Queen’s University Belfast. 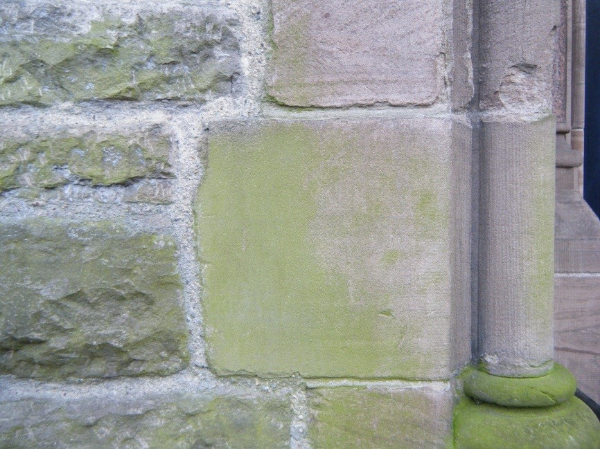 Recent observations have shown an increase in algal ‘greening’ of external sandstone walls in many places in the north west UK. As well as being unsightly, algal greening may contribute to the deterioration of sandstone, both biochemically (through the exudation of organic acids) and biophysically (by expansion and contraction associated with wetting and drying). Algal patches also change rock surface porosity and permeability, leading to altered sub-surface moisture regimes, a crucial factor in stone decay. Algal growth is controlled in large part by climatic conditions (particularly precipitation regimes) and air quality. Predicting and mitigating the impacts of future environmental change on sandstone buildings will therefore require an understanding of the controls on algal colonization and growth. The research carried out at the School investigated the colonization of sandstone surfaces by algae and the impact that algal greening has on moisture regimes and stone deterioration. Surface and sub-surface moisture were monitored using geoelectrical techniques (electrical resistivity tomography, or ERT). Algal colonization under different environmental conditions has been simulated in the laboratory. State-of-the-art molecular techniques were used to study algal community assembly. Ultimately, the research will lead to the development of practical guidance for the future use and management of sandstone masonry in the north west UK and beyond. More information on this project is available from the project website. Consensus or collision? 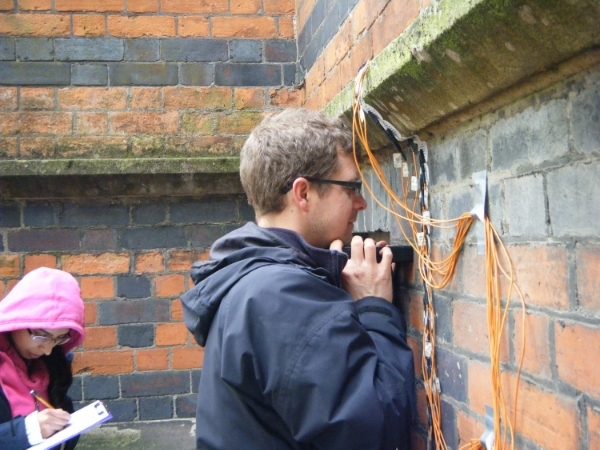 A site-specific approach to integrating methodologies for the historic environment. Funding: EPSRC, Arts and Humanities Research Council, ESRC, English Heritage. The UK’s historic environment has been widely recognised as an important national economic and cultural resource. This resource is both highly diverse and affected by a wide range of, often intertwined, pressures. Whilst huge progress has been made over the past century in understanding, conserving and presenting various aspects of our historic environment, studies have tended to be very fragmented and usually focused on a single challenge to one type or location of historical environment. In order to manage this important resource more effectively over the 21st century, improved and genuine cross-disciplinary research effort is needed. One key barrier to such improved research is the plethora of different methods utilised by workers with backgrounds in different areas of arts, humanities, social sciences, and sciences. Our project aimed to assess the impact of predicted climate change on the deterioration of limestone monoliths. In order to achieve this, we had three objectives, i.e. 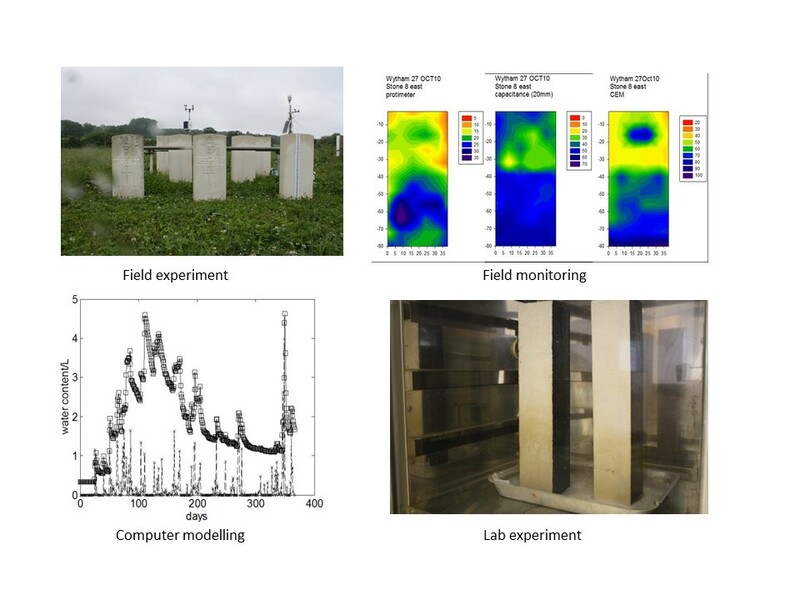 to investigate moisture regimes in limestone monoliths using an integrated programme of laboratory, field and modelling studies; to examine the influence of moisture regimes on limestone deterioration through field and laboratory studies; and to assess the impact of predicted climate change on moisture regimes and limestone deterioration through modelling and field studies. To meet these objectives we set up two dedicated experimental sites, one at Wytham Woods near Oxford, and one at Wakeham on the Isle of Portland in Dorset at which we installed automatic weather stations, soil water probes and a suite of stone monoliths. Following initial desk-based survey, we focused on Commonwealth War Grave Commission (CWGC) headstones, constructed from Portland Limestone, which are found widely across Southern England (and, indeed there are some 1.7 million of them worldwide). The CWGC are very concerned about their conservation and management. Our key findings are that, for the Portland Stone CWGC headstones which were the focus of our study, moisture regimes reflect rainfall, soil- and groundwater characteristics, with rainfall exerting a much stronger control than we had expected. In turn, we discovered general patterns of deterioration on CWGC headstones which could be clearly associated with these moisture regimes. The top of CWGC headstones is usually the most deteriorated portion, with the base the least deteriorated, which is not at all what we had expected. We have established that hand held moisture meters and the Equotip hardness tester can easily be used to map moisture and deterioration. Repeat surveys illustrate how moisture regimes respond to rainfall events. Furthermore, we have shown the value of time-lapse photography in recording moisture conditions on the surface of CWGC headstones. The Hydrus model runs we carried out confirmed the field observations we made. Finally, we have shown the value of modelling (using the Hydrus package with our meteorological and soil moisture data as inputs) in predicting moisture regimes under different climatic situations. Funding: University of Oxford Fell Fund. Many important examples of global cultural and natural heritage are founded on sandstones and conglomerates which are prone to deteriorate, such as Petra in Jordan; the rock art of the Acacus Mountains, Libya and Zhangjiajie Geopark in China. 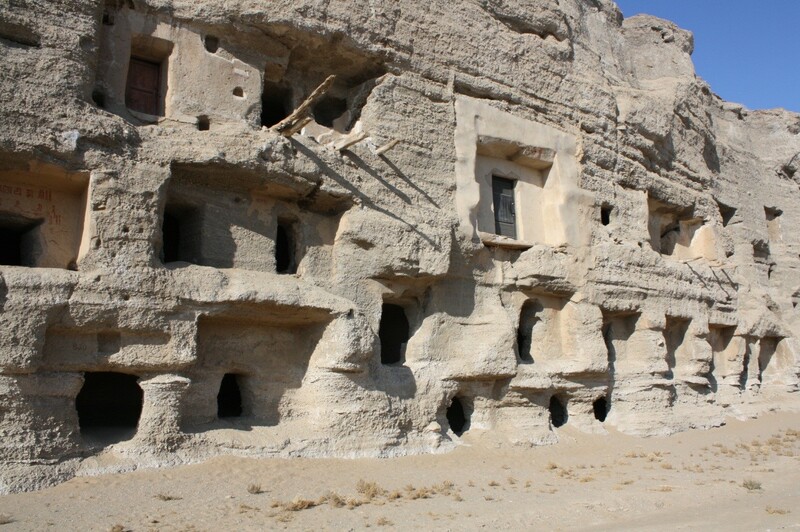 Mogao, a World Heritage Site near Dunhuang in NW China, is one such site in which cave temples cut into a sandstone/conglomerate cliff play host to important rock paintings. Deterioration of the rocks from a combination of wind-blown sand and salt weathering is a serious problem here, and affects the integrity of the wall paintings. This pump-priming project aims to develop innovative laboratory experiments to investigate the causes and nature of deterioration and test more nature-friendly conservation techniques. 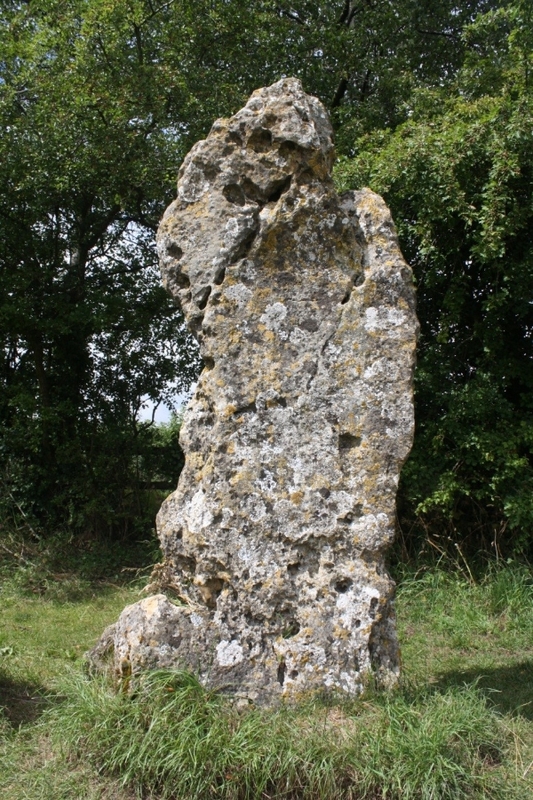 We carried out a rapid assessment of the state of the Rollright Stone circle near Chipping Norton, for the Rollright Trust which looks after them. Preliminary observations of the rate and nature of weathering of the Rollright Stone circle indicate that the stones could have lost 3-10cm depth of material since the circle was created through dissolution by rainwater (directly falling on the stones and coming in from the soil). Much of the complex relief on the stones (such as randomly orientated pits and fissures) was probably inherited from previous natural processes, rather than being produced since the stones have been in situ. There are some areas of recent flaking, especially near ground level, which are probably a result of frost weathering in recent harsh winters. Lisa’s current research investigates the impact of armed warfare on heritage conservation. Rapid development of warfare technology in this past century has left an unprecedented impact on immovable heritage such as palaces, religious buildings and monuments. The impact of these weapons on this heritage is yet unknown, even though damage to monuments is widely visible in Prague, Budapest, Dublin and many locations in the Middle East. This research investigates the impact of armed warfare on heritage sites through laboratory simulations using samples created and weathered under known conditions. 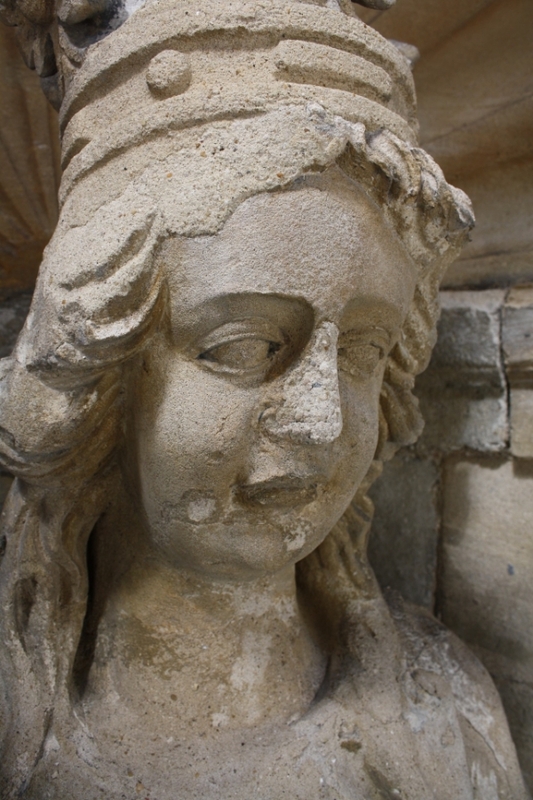 Fieldwork has also been carried out at the church of St Mary the Virgin, Oxford, to investigate the impact of target practice carried out by Parlementarian troops on the statue of the Virgin (ca.1640s).